shopspaViolet is Serious Skin Care, Serious Fun: Which to Choose? SkinCeuticals CE Ferulic or Phloretin CF ? 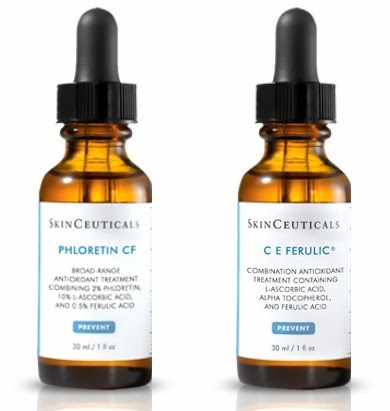 SkinCeuticals makes two of the best Vitamin C serums on the market, Phloretin CF and CE Ferulic. They shine above the rest for their quality in stabilization of the Vitamin C and the other ingredients they pair it with to enhance and make more effective than just using Vitamin C alone. With each retailing for a little above $150 for 1 oz. many consumers want to know which is the right choice for their skin. We have blog articles about the benefits of Vitamin C, Vitamin E, Ferulic and Phloretin, just click on the links to read the benefits. Both Phloretin contain Vitamin C, Phloretin CF at 10%, CE Ferulic as 15%. Both contain pfloretin at 0.5%. Only CE Ferulic contains Vitamin E, at 1%, and only Phloretin CF contains phloretin, 2%. Powerful combination of antioxidants that work together to enhance each other. All antioxidants degrade under UV rays, however these antioxidants also help to prevent sunburns and the damage that UV rays can cause, making them most effective during the day. Apply in the morning or before going out in the sun. After using you can apply other lotion or makeup as needed. Serums work best after using a cleansing system such as Clarisonic, which can make penetration of the serum 61% more effective, which is important since serums can be expensive and offer so many benefits.